Mark Alan Stamaty’s graphic story will resonate with anyone who has ever visited a library. 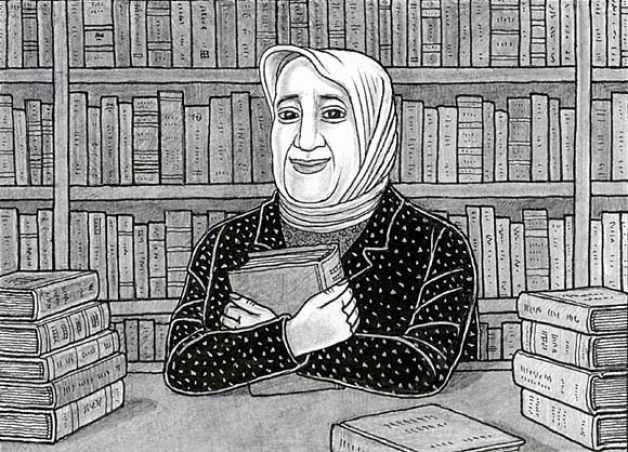 Its simple black and white drawings tell the story of Alia, a woman who lives and works in Iraq during Saddam Hussein’s reign. Iraq is on the verge of chaos as Britain and the U.S. are planning to invade the country and remove Hussein from power. Alia is the head librarian at the Basra Central Library. We are told that “ever since she was a little girl, books have been a source of happiness and adventure for her.” When she reads the story of how the Mongol Invasion destroyed the Baghdad library resulting in the loss of “irreplaceable treasures” Alia worries that something similar could happen to her beloved library. When the fighting starts in Iraq, Alia feels compelled to save the books in the library. When she can’t get her own government to help her, she starts moving the books herself. 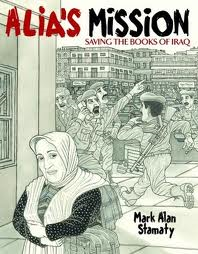 Alia’s Mission: Saving the Books of Iraq is a simple story, geared for younger readers. It only took me about ten minutes to read, but don’t let that deter you from checking it out. Alia’s story proves what book lovers already know: books are worth fighting for. This entry was posted in Uncategorized and tagged 2014, graphic novel, non-fiction, younger reader by Christie. Bookmark the permalink.